Before I moved to San Luis Obispo County, I thought long strands of Spanish moss could only be found in the South. I was wrong. When I moved to Templeton, it seemed that Spanish moss was decorating most of the trees I saw. It is especially prevalent in old and shady oak forests. But it's certainly not limited to forests. The moss is also often seen in orchards -- especially old orchards. 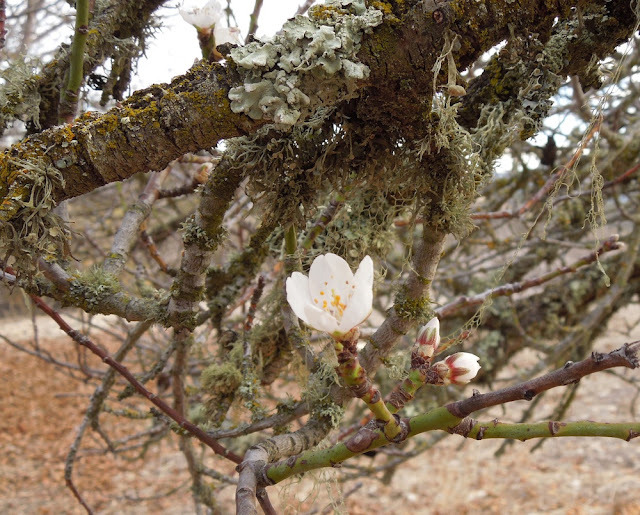 You can see it here in my very old almond tree. 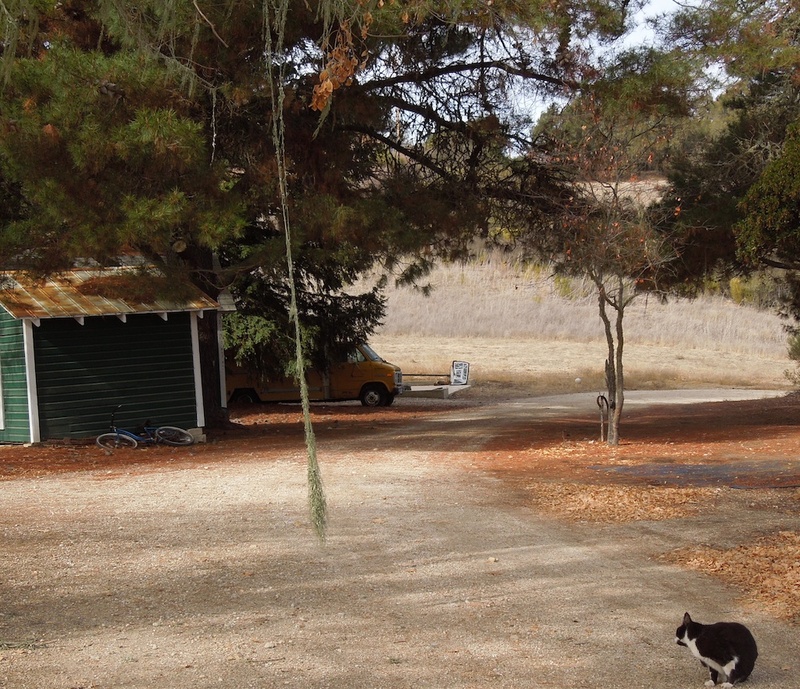 Spanish moss can usually be found in the neglected orchards remaining from the days when Paso Robles was a major almond grower. 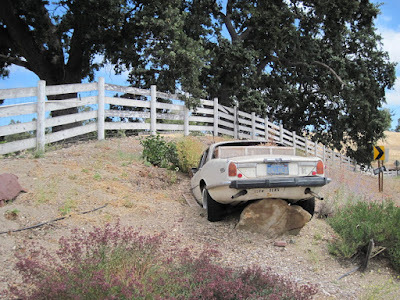 These orchards are usually found on back roads and on hilltops around the city. 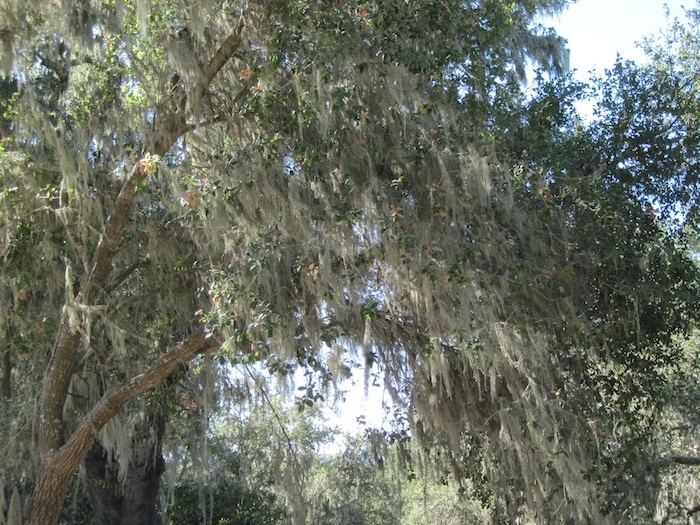 Although Spanish moss is often found on trees that seem to be dying, the moss itself does not hurt host trees. It does not steal any of its nourishment or water. Where there is a heavy growth of moss, it does sometimes shade the lower branches and prevent light from reaching them, but in a forest, other trees will do the same thing. You will sometimes find mistletoe right beside Spanish moss. 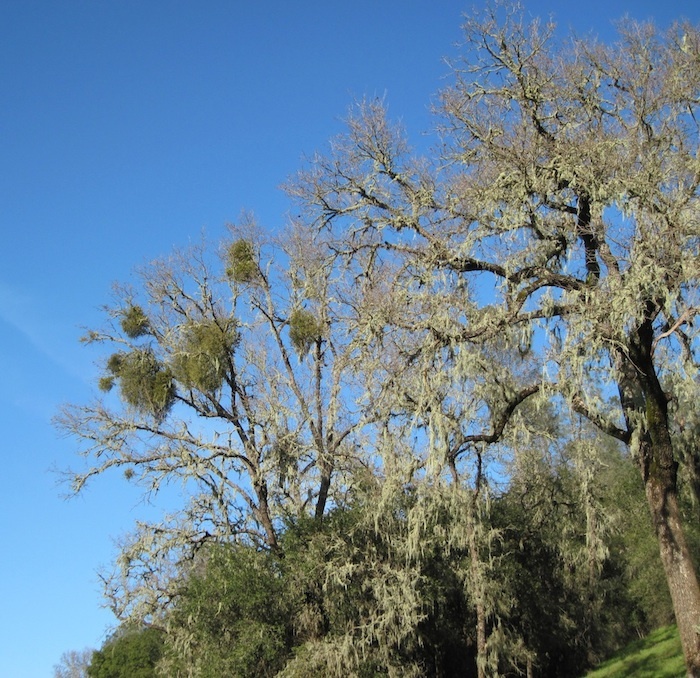 The mistletoe is detrimental to a tree's health. This photo shows one of the longest strands of Spanish moss I've seen on any of my trees. I was trying to interest my neighbor's cat in playing with it, but since I wanted her to, she wouldn't. Today I finally got around to some shopping in the Walmart Center. 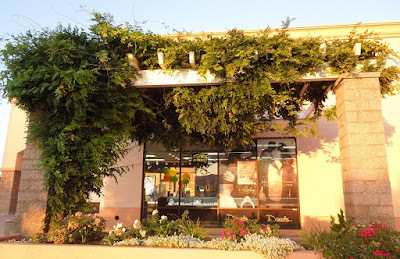 I found little of what I wanted, but I did experience a bit of urban nature. On the way from my car to Big 5, I passed under this vine-covered arbor. The birdsong coming from it was amazing. Besides the songs, I also could hear the birds moving from one part of the plant to another. I heard wings flapping and branches moving. There must have been at least a hundred birds up there. I wanted to get a photo of the birds. They were fairly small and blended into the shadows of the plant. They were moving almost constantly. As soon as one or two would perch, I'd try to find them with my zoom. Then they would move out of sight and hide again. I made several attempts to capture them with my camera, but this is the closest I could get. Look in the center right. The head and most of the tail and body are hidden, but I believe if you look closely you may find one of the birds. Clicking the photo will enlarge it. 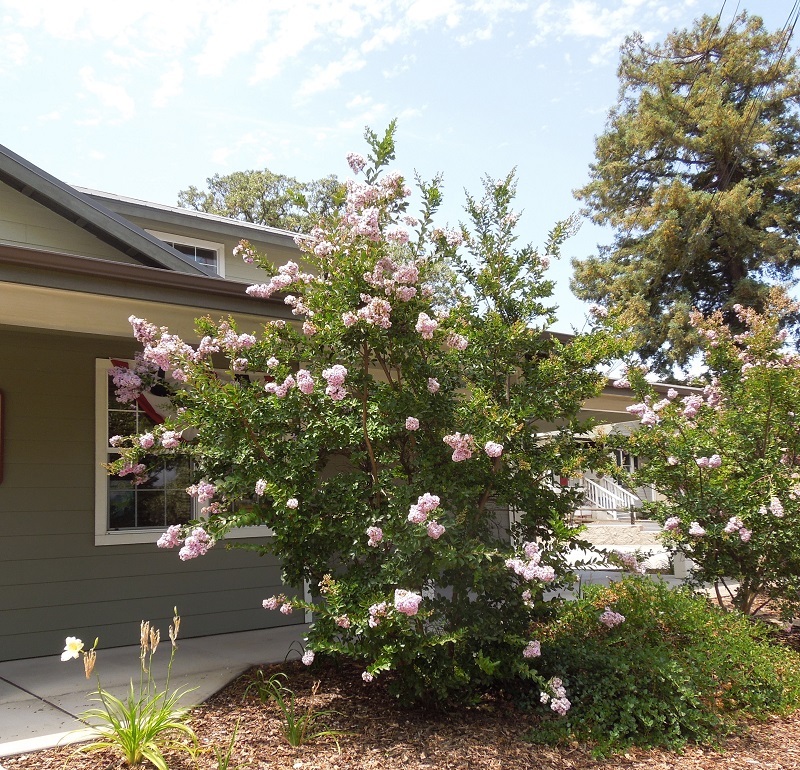 If you've never been east of the Salinas River in Templeton, you haven't yet explored El Pomar Drive or discovered Finley Family Nursery. It makes an interesting drive in the country if you'd like to discover some new territory. I can show you some of that another day. One distinctive thing I've seen right as you approach Finley Family Nursery from the south is this car. If you click on the photo it will enlarge, but you will still need very good eyes to see what is written under the bumper: SLOW DOWN. 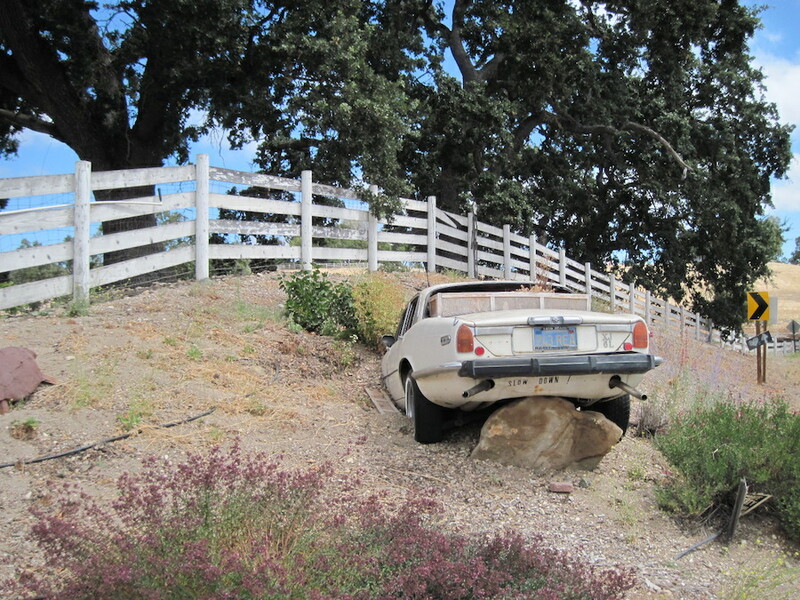 I think the wrecked car gets the point across well for those who want to speed down these country roads. I haven't been home much this summer to pay attention to what's left of our orchard. One of our apple trees died a few years ago - the most productive one. It had been so heavily loaded that it split, and we were unable to save it. We still mourn its loss. The Fuji apple tree we planted never got established before it died. 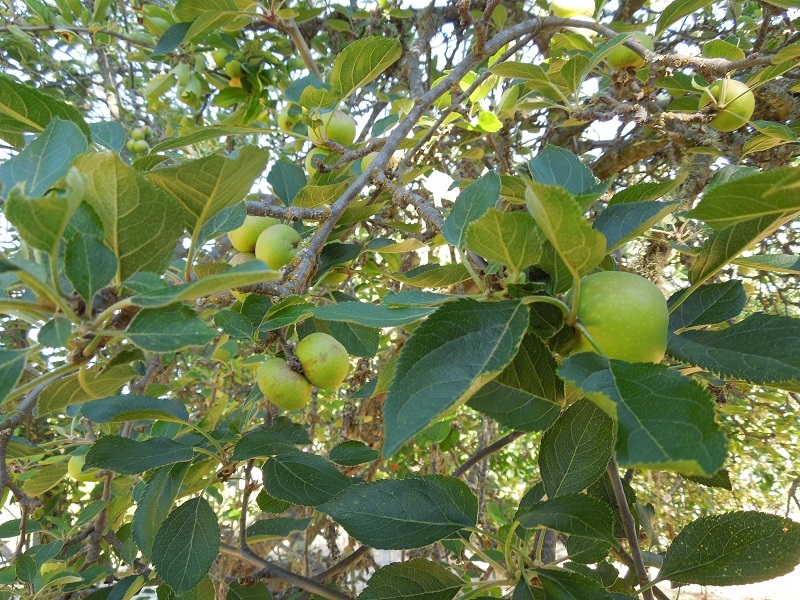 What you see in the photo is our remaining tree, and we are hoping the wildlife will leave us some of these apples. We expect them to get ripe soon. Maybe they are already ripe, but just small, due to the drought. We have not been as fortunate with our grapes. Our most productive vine happened to be in the spot where the septic tank people decided to dig a new leach field. It happened while I was gone, and when I came home, our entire fenced garden area was gone except for the garden gate. That left us only this exposed grape vine. 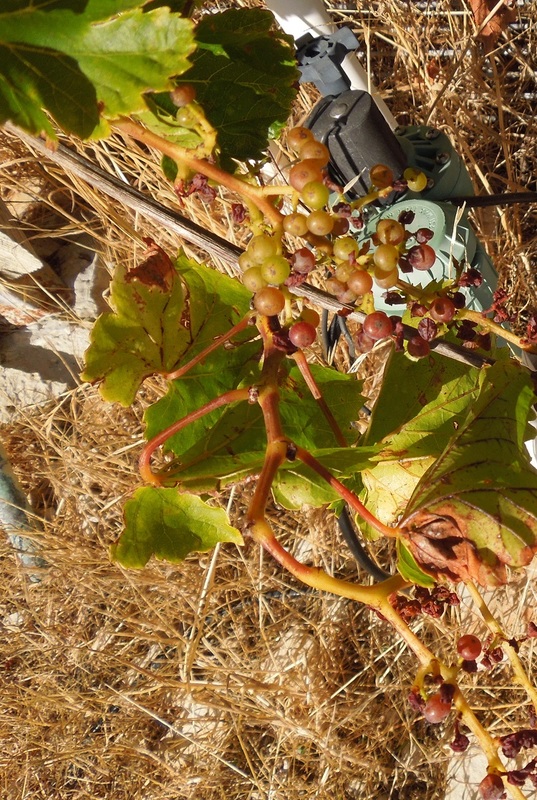 The grapes were tiny this year due to the drought. We still had some bunches of tiny green grapes when I was last in Templeton a couple of weeks ago, but when I checked Saturday, it appears they had been ripening, and this is all the deer left us. If you click the photo, it will get larger. All the little green apricots I saw on our tree last month have disappeared. The walnut trees seem to have a fair-sized crop, and the quince tree is doing well. I have never been a student of international flags, just as I was never a great student of geography. I took the required freshman course in high school, but most of what I learned about countries and maps back then has changed as countries have disappeared or been renamed. 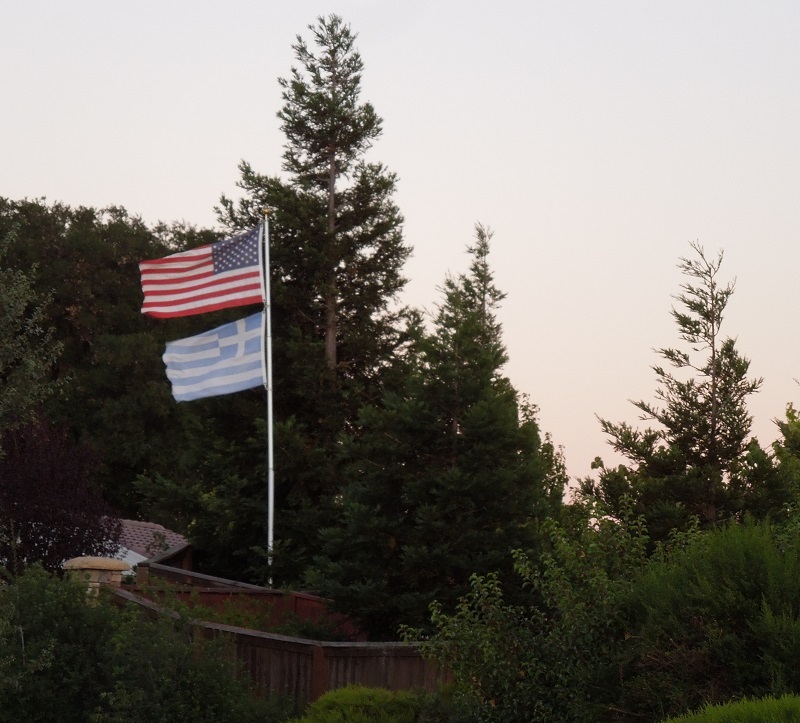 That is why I had to Google to identify the flag flying under the Stars and Stripes when I stopped to photograph it on Vineyard Drive Saturday night. In case you are as poor a student of flags as I am, it's the flag of Greece. Both flags are backwards, since I was photographing them from the outside of the fence and could not see them from the front side. The cross symbolizes the Greek Orthodox Church. There are different possible meanings for the stripes. Just click the link above if you are interested in them. 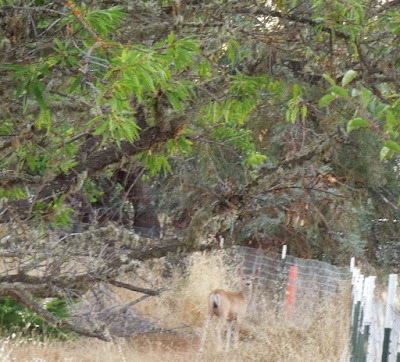 Tonight on my way to Trader Joe's along Vineyard Drive in Templeton I saw a doe and her small fawns crossing the street into the shrubs on my side of the street. How I would have loved a photo, but there was no good place to park and chase them. I had only gone about a block more when I saw a deer on my side cross to the other side. 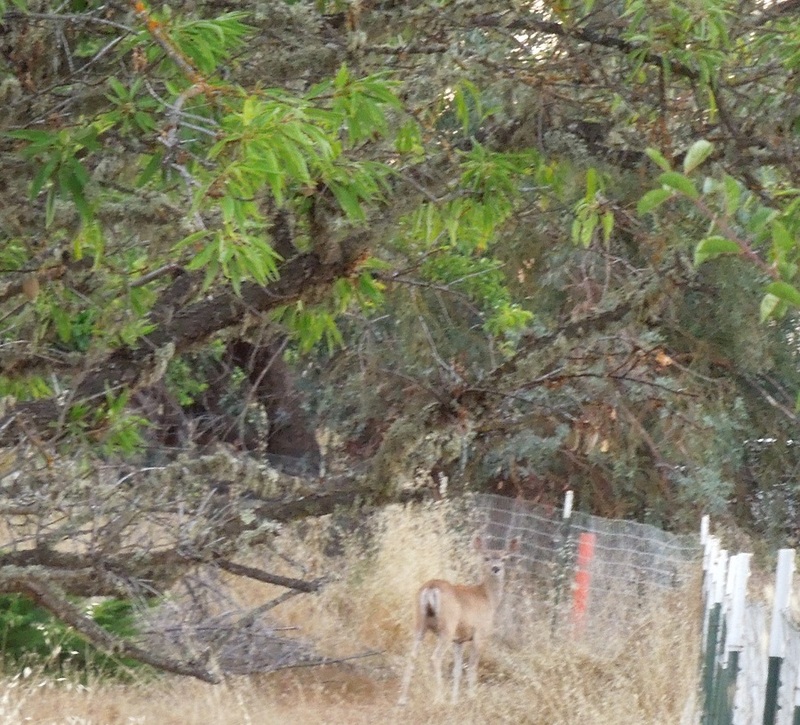 I did stop to give chase, but by the time I had parked and found the deer, it was all the way at the back of a deep lot. I had to use a zoom to get this. What's strange is that it didn't move while I was trying to capture this picture. This is one of my few deer encounters this year. You can enlarge the photo by clicking on it. I saw a bear statue one day while I was walking the creek path that begins near Mission Plaza in San Luis Obispo. Here's how it happened. I decided to take the path farther than usual, past Mission Plaza, under the bridge near the art museum, and to the other side. This seemed to be where the ducks were hiding out. I've never seen them in the creek near the mission. 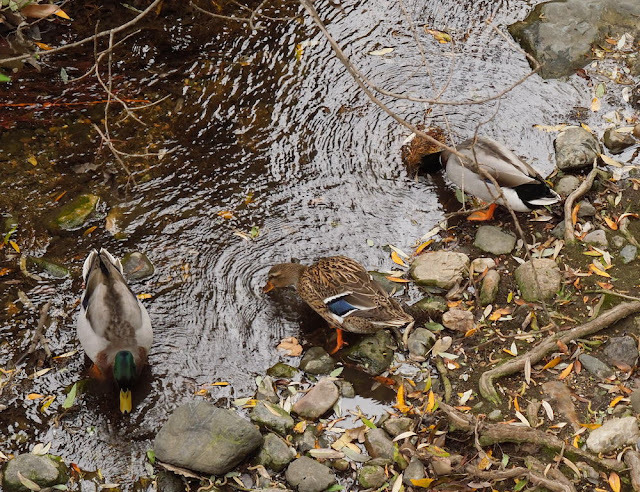 At first I only noticed the ducks, and I spent a lot of time photographing them. 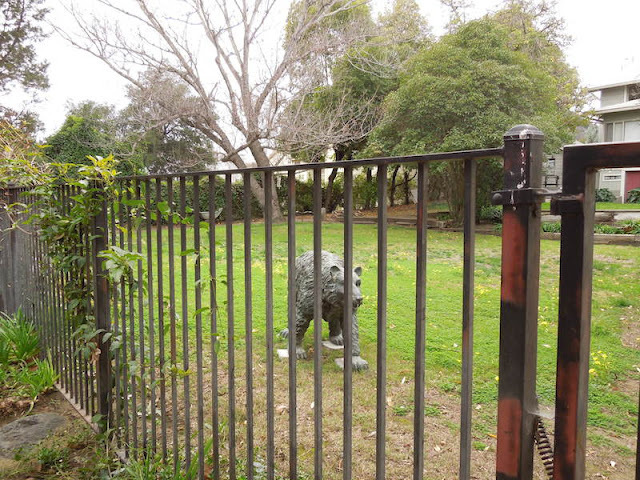 Then I happened to look to the other side of the path and I saw this bear statue on private property. It seemed appropriate, somehow, to see the bear so close to the creek. I'm guessing that had anyone been thinking of climbing that fence at night to rob the house, he would have had second thoughts after seeing that very realistic bear. Bears have been spotted in San Luis Obispo, and it would not be unusual to find one near a creek. After dark, the details might be obscured. I have put just the statue, without its surroundings in the photo below. Have you ever noticed this statue when you walked the creek? It's a large as a real bear. 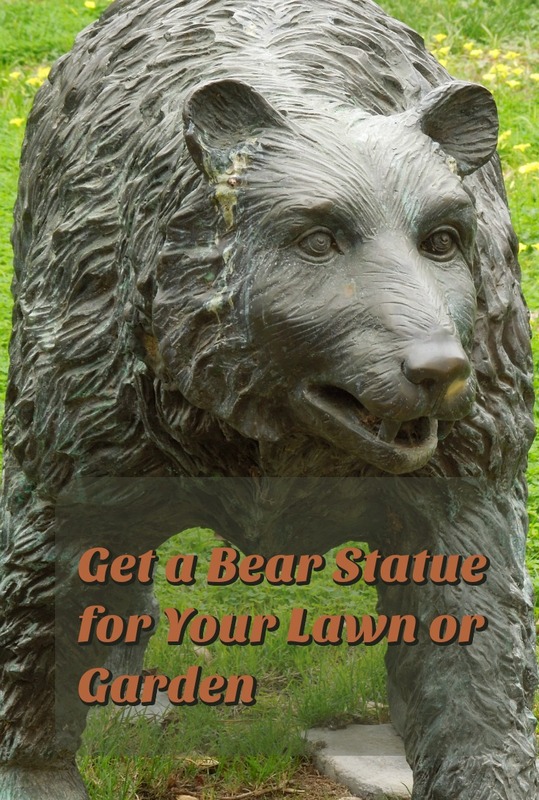 Would you like a bear statue similar to it in your yard? Maybe this close to life-size bear below would deter trespassers who are up to no good. I personally might be intimidated by it were I to encounter it. If I saw it, especially at night, I'd be inclined to go quickly in the opposite direction. Maybe you'd prefer a smaller bear, or a bear cub or two climbing one of your trees? The climbing bears have brackets in the paws to mount them on the trees. The reviews indicate that the Toscano bear sculptures wear really well. The tree hugger attaches with a keyhole on the side of the head. You will need a long screw or nail to attach it. None of the statues below are life-size, but they get high ratings from those who have bought them. Most customers love them because they are so adorable and make great conversation pieces. I'm partial to the cubs in the trees. 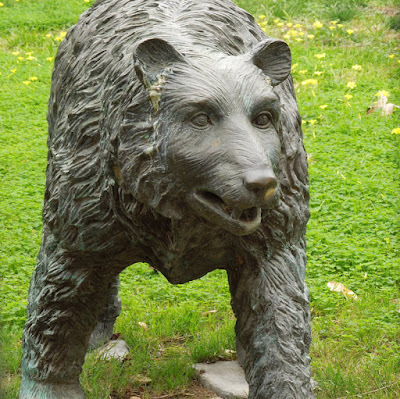 Which is your favorite bear statue? My posts have been short this past few days and today, because most of this week I've been preparing for the colonoscopy I had this morning. Like most people who take this diagnostic procedure, I dreaded it. As most people who have taken this test know, the colonoscopy itself is a piece of cake compared to the preparation one has to do. The worst part of that is the liquid diet for about a day and a half before the test followed by another 24 hours of powerful laxatives and their aftermath. In contrast, the procedure itself is easy. The worst of that was the very tight blood pressure cuff that squeezed my arm painfully about five times before they knocked me out. It seemed they had barely knocked me out when I was waking up, all finished except for getting unhooked from all my monitors and IV's. The best part of the preparation was having lots of time to read. In four days I finished six novels -- five mysteries and one romance. You can see them in the photo above. 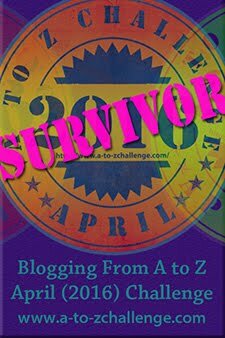 I checked them all out Monday at the Paso Robles Public Library and finished the last one today. 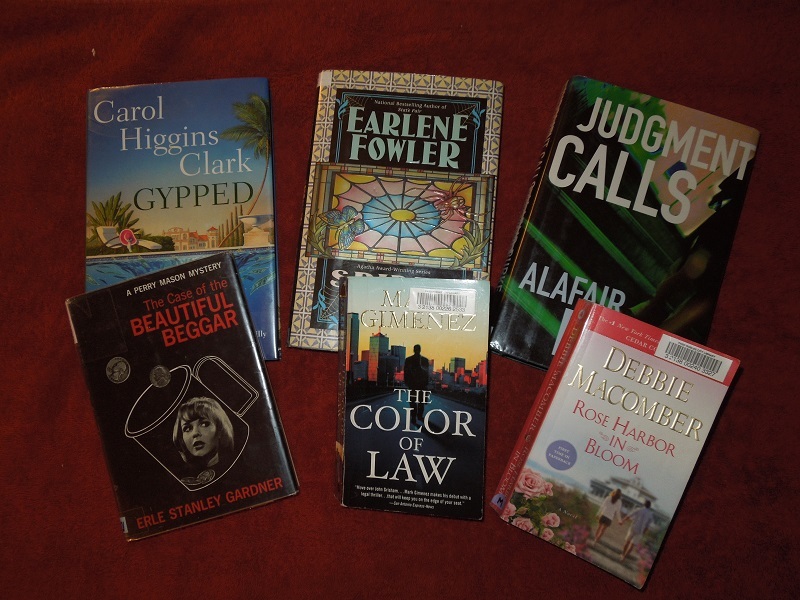 Earlene Fowler, Carol Higgins Clark, and Debbie Macomber are favorite authors. I find Erle Stanley Gardner's Perry Mason's mysteries keep my mind occupied and are quick to get through. A gentleman who was browsing new books next to me suggested I try reading a new author, Alafair Burke, so I checked out some of her legal thrillers to sample. On my own I decided to try The Color of Law by Mark Gimenez, another legal thriller. All of these books took my mind off my MoviPrep cocktails and helped entertain me while dealing with the results. One does not want to sit in a bathroom for hours a day with nothing to read. I enjoyed all these books, so having time to read them was the best part of this entire week -- except for finally putting this colonoscopy behind me for another ten years. Observations: It seems there are changes in the recommended preparation for the colonoscopy since the last time I endured it. First, I had to mix the MoviPrep cocktails myself. Second, it didn't seem to taste as bad as last time. Last, you don't get much sleep for the 24 hours preceding it. I don't remember exactly when I had to take the laxatives last time, but I know I didn't have to take the last dose 4-5 hours before arriving for the procedure as I had to this year. For me that meant being up at 3 AM and staying up. There is no way to settle down and sleep once you start taking the MoviPrep because you will be on the run for the entire night. I didn't even bother to go to bed. I read all night. Feel free to share your own experiences with this procedure below. Is Your Kitty a Fur Person Who Has Chosen You? Does a Fur Person Live with You? Many years ago I read a book called The Fur Person by May Sarton, that perfectly captured the personality of an independent cat who decided one day to choose a person to settle down with. I loved the book. One of the regular parts of the gentleman cat's day was "to read the newspaper." That meant finding a good place to observe the world and see what was happening. 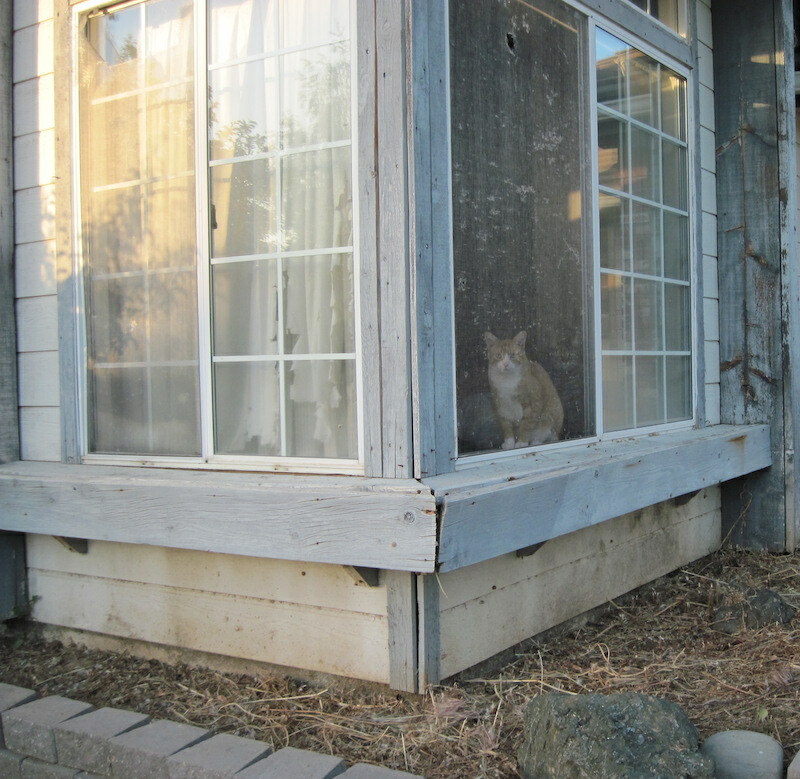 I thought of that as I walked past this house in my neighborhood one day and saw this cat through the window, looking out -- probably "reading the newspaper." If cats fascinate you, you won't want to miss this book. It's been around a long time, but it's still available. It contains ten original drawings and a fictionalized story for grown-ups of a cat about town, The Fur Person, and his search for a suitable home with a suitable housekeeper. I highly recommend you get a paper edition if you don't have an eReader that properly displays illustrations. The illustrations are an important part of the book.The gift edition above is perfect. This book should be an important part of any cat lover's library. Get it for someone you love, even if that happens to be you. 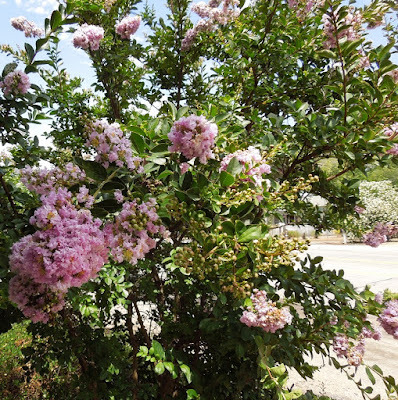 I never remember seeing crape myrtle when I lived in Southern California, but I wasn't really paying attention to which trees were doing what in those days. I first noticed these trees on the way to the post office one day during August. There was a gorgeous deep pink flowering tree on Sixth Street as I was heading north from Vine. 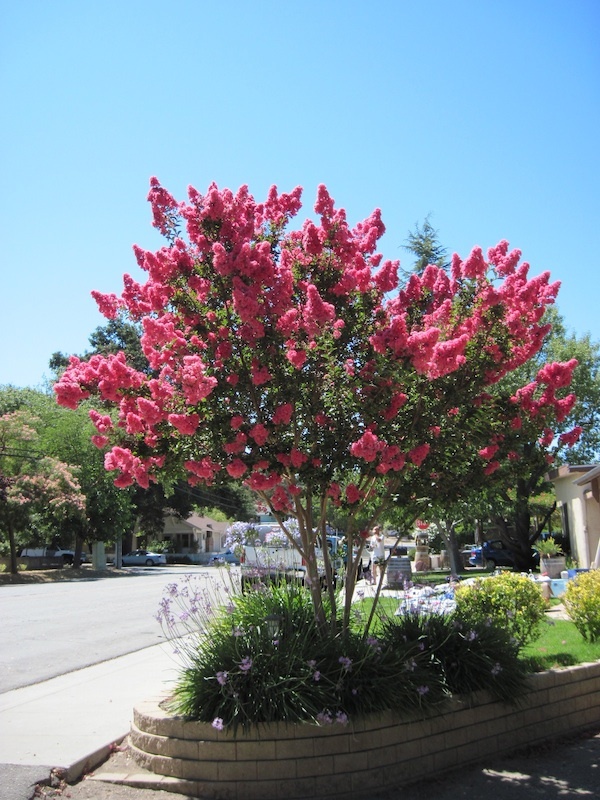 It was such a stunning display, I had to stop and inquire about the name of the tree. 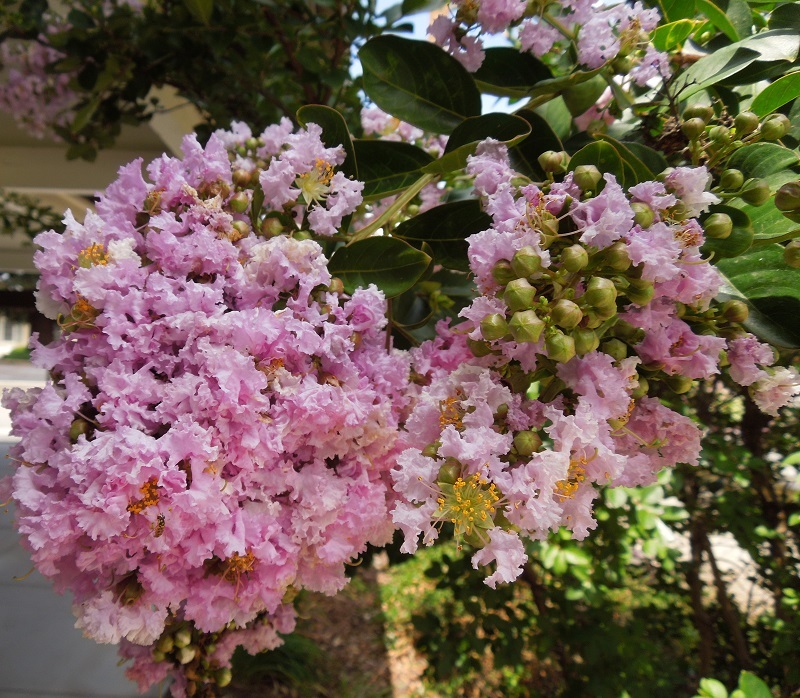 I was told it was a crape myrtle. 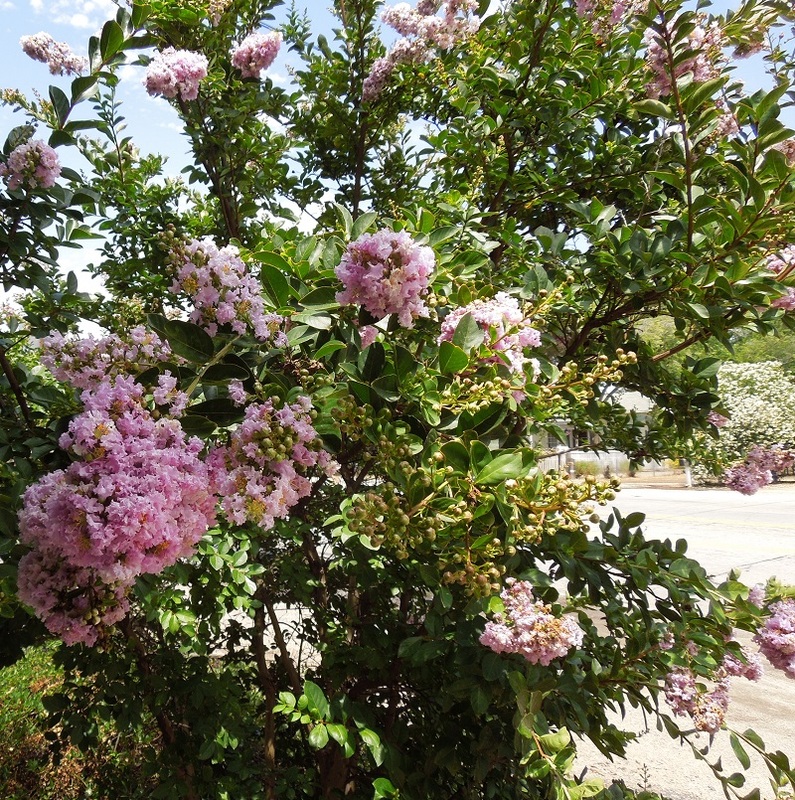 It seemed after that I began to notice the crape myrtle trees in the summer whenever I saw them in bloom. Their bright blossoms are the only ones I've seen with the texture and look of crepe paper. They bloom from July to September. Yesterday I was visiting one of my doctors and he had some light pink crepe myrtle trees in full bloom. Some of the flowers were fully open, and some were still budding. This is a selection of one of the trees as a detailed overview of a large part of the tree. Click any photo to enlarge it. To the left is a close-up of part of the section above so that you can see all parts of the flowers and buds in even greater detail. them at a gas station in Buellton. I have seen them in these pinks, red, lavender, and white. Mildew resistant varieties are available. 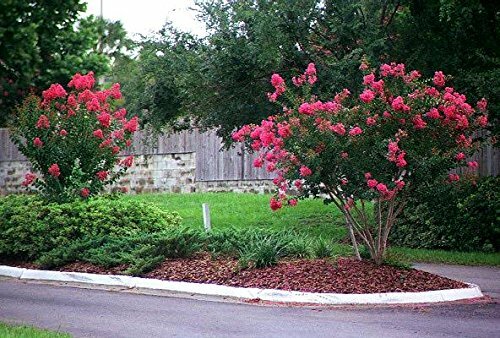 Crepe myrtle trees are available from Amazon in many varieties. I will show you one of my favorites below. If you click through, you will also see others. The one I'm linking to is pest and disease resistant. As I was leaving the library this evening, I saw something I've never seen before. 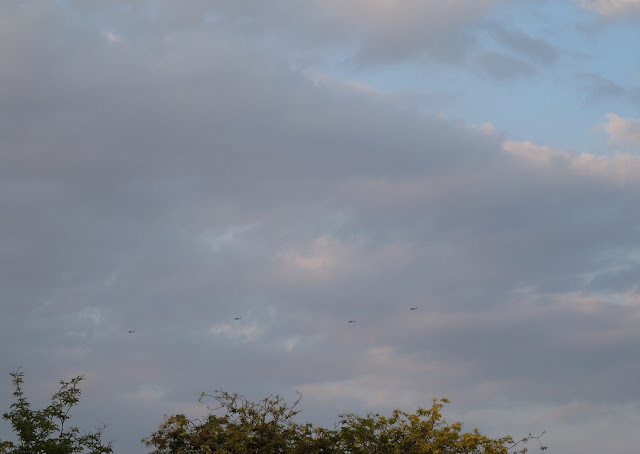 On the way to my car I happened to look up at the sky and I saw a row of at least five helicopters flying one after the other. I have often seen single helicopters, but never a row of them like this. I raced to car to get my camera, but they were some distance away. 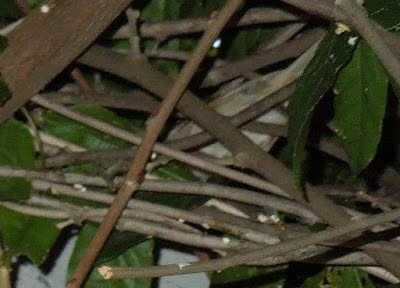 I took one quick shot (see below) that had most of them, but they are very tiny in the photo. 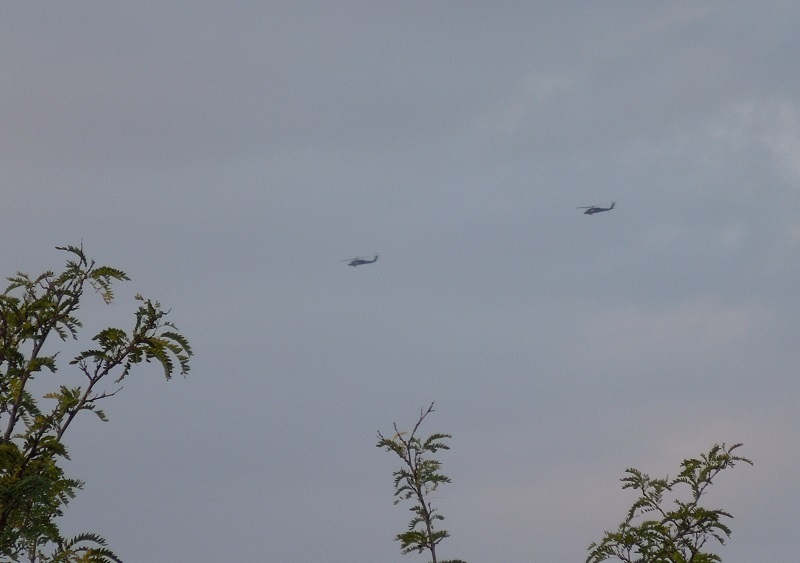 I used a zoom to get the top picture, but by the time I got it in focus, most of the copters were hidden by the trees. I could have cropped this picture to the right more drastically, but I didn't want to chop anymore of the sky off. I cut most of the treetops off instead. The planes were flying northwest. You can click to make it a bit larger. 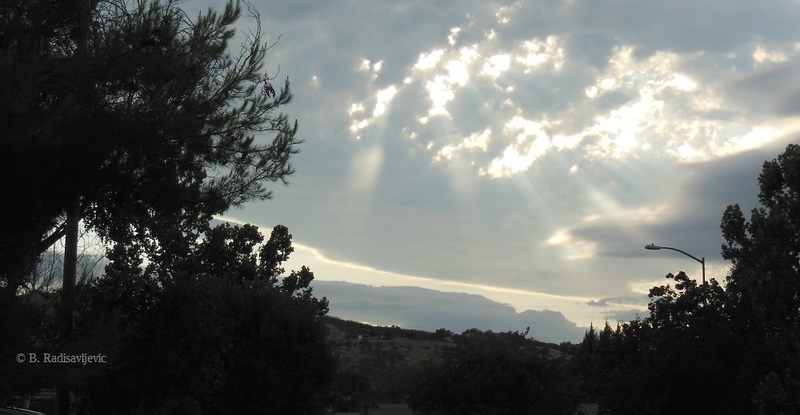 What's the most unusual thing you've seen in the sky lately? I saw this beauty in the sky Saturday night as I came home from Kennedy Club. I have seen several skies full of what appeared to be storm clouds this month, but none of them kept their promises. 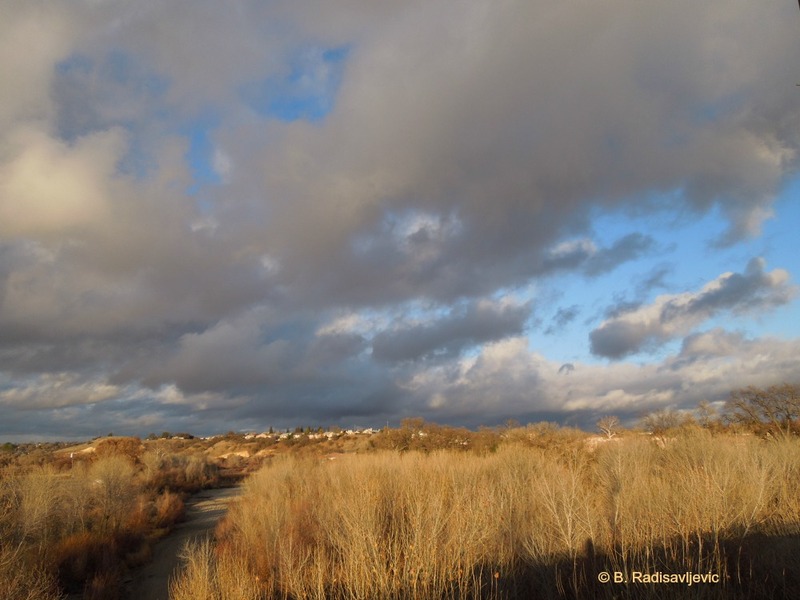 When I saw this radiance from the clouds, I wondered if this time we would see our much needed rain. At first we heard what sounded like a heavy rain, but it lasted less than two minutes. Then we got some sprinkles, and then it seemed to stop. I was afraid that was the end. Then God gave us the rain we had been praying for. We not only saw it, but we heard it coming. Even as I write this on Sunday afternoon, the thunder is still booming from the heavens. Last night it felt like my bed was in the middle of a battlefield. Light kept flashing through the windows followed by booms that shook the house. I was reminded of the words to these verses of "O Worship the King," by William Kethe in 1561, which is based on Psalm 104. From generation to generation, the people of God have recognized God's blessings given to all in the form of nature - the sun, the sky, rain, oceans, lakes, rivers, plants and animals. God gives freely. We need only to gratefully receive and use his gifts wisely. Today I rejoice in rain once again, just as I did when I wrote the poem "God's Gift of Rain" a few years ago. 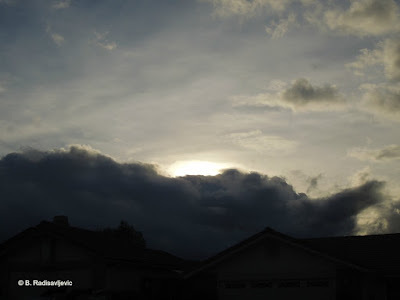 Read more about the Blessings of Rain in my musical photo essay on HubPages. What's Wrong with Loitering in City Park?